Coral Calcite is a lovely coral pink/orange colored calcium carbonate. Working primarily with the Root, Heart, Sacral and Solar Plexus Chakras, Coral Calcite pulls the high vibration of Divine Love down into these chakras and channels to help promote vitality and confidence. This action can help to bring an overall appreciation for life, lifting up any negative emotions, to be transmuted into positive and integrated into daily living. 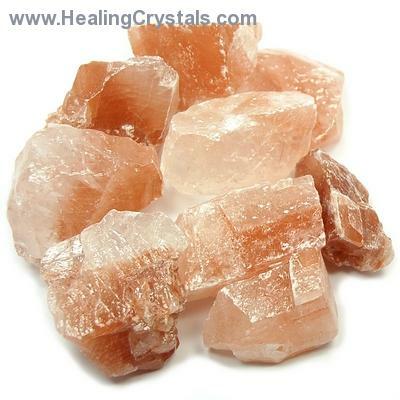 Clearing and activating the Heart and Solar Plexus Chakras, Coral Calcite amplifies one's virtues and helps one to learn to live by them, by inhibiting the influence of negative energy and by enhancing the positive will. Those who have had traumatic experiences can use Coral Calcite to help heal the rifts left in the psyche, making room for Divine energy to enter into the Heart. This enables Coral Calcite to exert its influence by activating sympathy and compassion for others as well as for the self. Physically, Coral Calcite, like most Calcite, helps with urinary tract disorders; pancreas, liver, spleen and kidney function; incontinence; sexual dysfunction, and chronic fatigue.